I like a spicy hummus, but to each their own. This is easy to make at home, but I buy mine at the store. Recipe, short version: Slice the veggies. Roast the red peppers and onions with olive oil and spices. Combine ingredients and enjoy. Turn the oven on to about 400 degrees. Cut the red pepper into roughly even, bite-sized pieces. If they’re wet from being washed, dry them off with a paper towel a bit. Throw the pieces into a bowl, and throw in a bit of olive oil and spices – I like cayenne and chili powder. Spread on a pan, and roast for 15-20 minutes, turning at least once. Cut the onion. You can either do fewer larger pieces or more small ones; if the latter, make sure you have room to spread them out on a large pan, and make sure to turn them, as they will burn more easily than larger pieces. Again, roast at around 400 degrees for 15 minutes or so, turning at least once or twice. Once they’re cool, add to the salad. Peel and cut the cucumber. I like cutting the pieces into fourths so they’re really bite-sized. I get the black olives and artichokes sliced and ready to go in cans, so all I have to do is open the can, rinse or soak them to remove some of the salt, drain them, and throw them in. When you’re ready to serve, or pack for lunch, add some hummus. 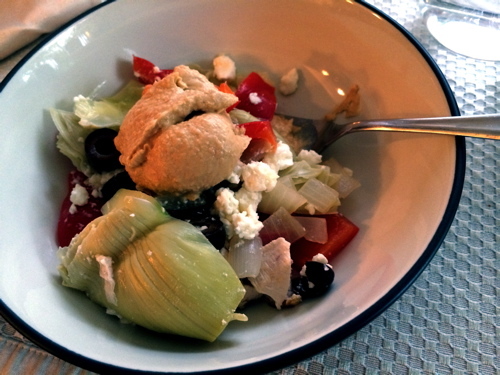 This entry was posted in Recipe, Salad and tagged hummus, Mediteranean, salad. I make something like this (it includes greek yogurt) for a layered dip. Love your idea of roasting the red pepper with some cayenne and chili powder for some additional heat! Thanks Jackie for your yummy ideas!